How was your Thanksgiving? I had a great one. 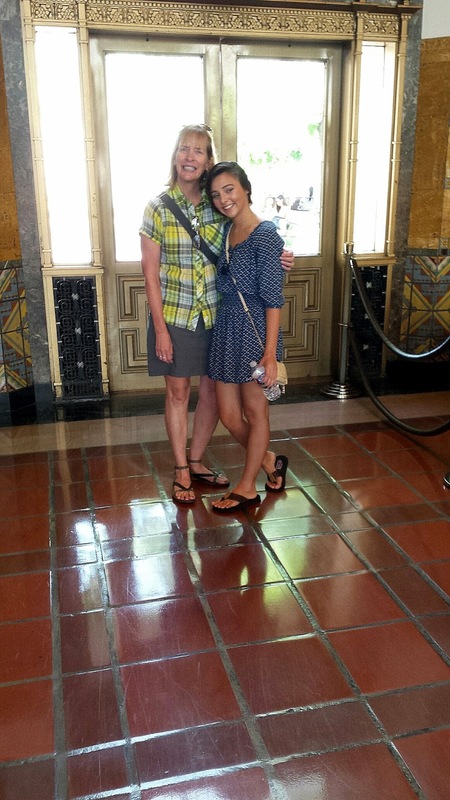 Company was in from out of town and they wanted to do the tourist thing in downtown Los Angeles. Our first stop was at Philippe’s Original French Dip. That’s always a fun place for lunch. But, I failed to pull out a camera. 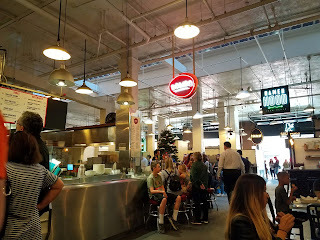 However, I did remember to get a picture at the Grand Central Market. 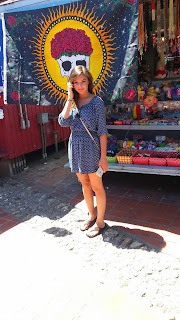 Gosh, you really could spend an entire day just exploring all the different stalls. And, what a wonderful cultural diversity of eateries. 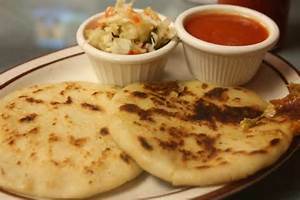 We brought home Salvadoran pupusas for dinner. The Central Market has quite a history and if you are interested, you can read a little about it here. 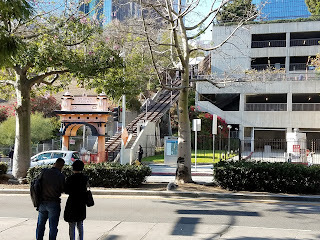 Another interesting historical landmark is Angel’s Flight. It is directly across from the Central Market. I remember my grandmother taking me on it as a child. Sadly, it is no longer in operation. You can, however, walk up the stairs along side. 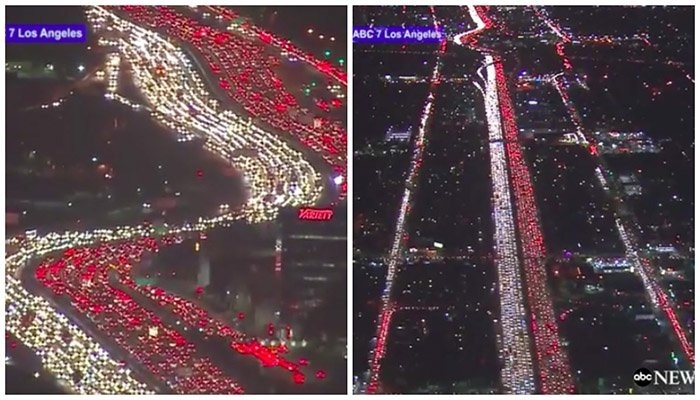 I don’t know if you saw what the freeways looked like over Thanksgiving week here in Southern California. I’m so glad that I had set a goal to be on the way home by 3:00 PM. 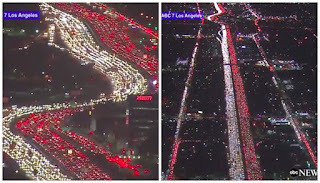 We avoided this mess. 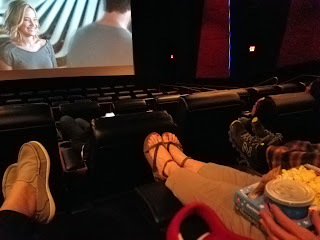 We also managed to take in a movie at one of the new “Recliner” seat theaters popping up everywhere. I must say, I am getting hooked on them. It was back to normal on the weekend and believe it or not, it rained both days. 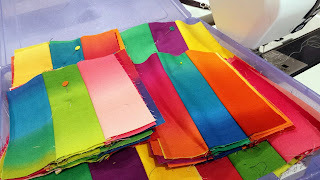 A perfect time for sewing. 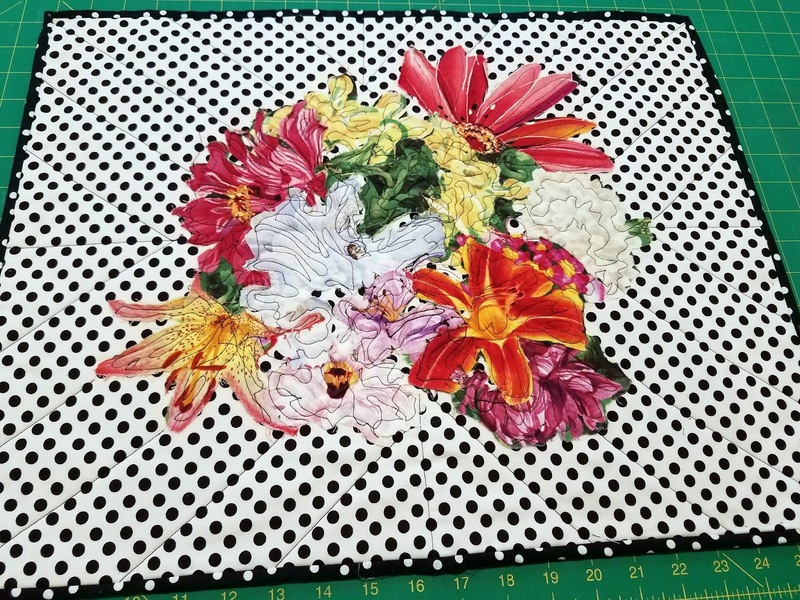 So I managed to finish this quilt top. Wow, it’s been a couple of weeks since I’ve posted anything. 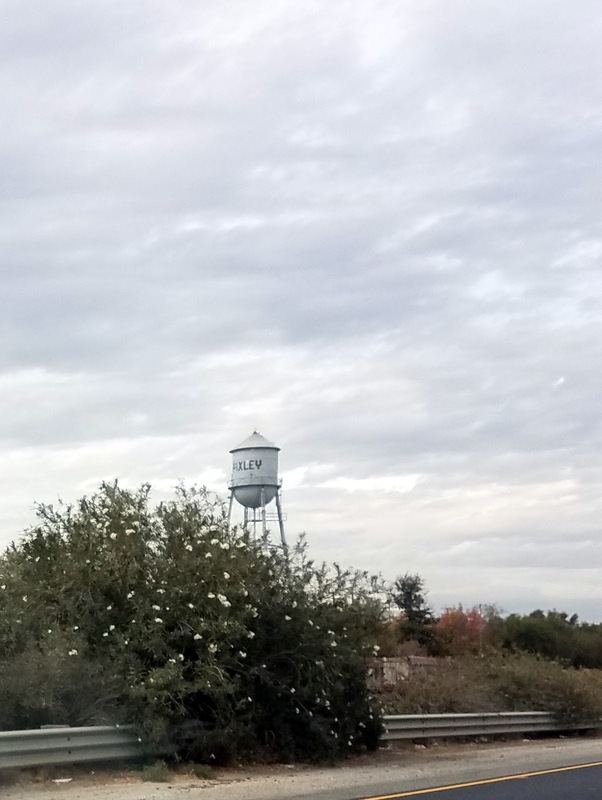 I took a small trip to from where I hail (I haven’t lived there for more than 50 years now). Oh the memories. As I dipped into that big Central Valley farmland, I saw that they were harvesting the cotton. It’s been a long time since I’ve seen this. And, I don’t remember it looking exactly like this; but, these are bales and bales of cotton ready to be transported. 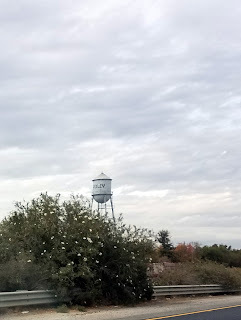 Another very fond memory of mine was the “Pixley” water tower. I always remember that as we would drive past it, we were close to home. It was nice to see it is still there to greet us. As for sewing, there hasn’t been much of that lately. I did finish this batik quilt. 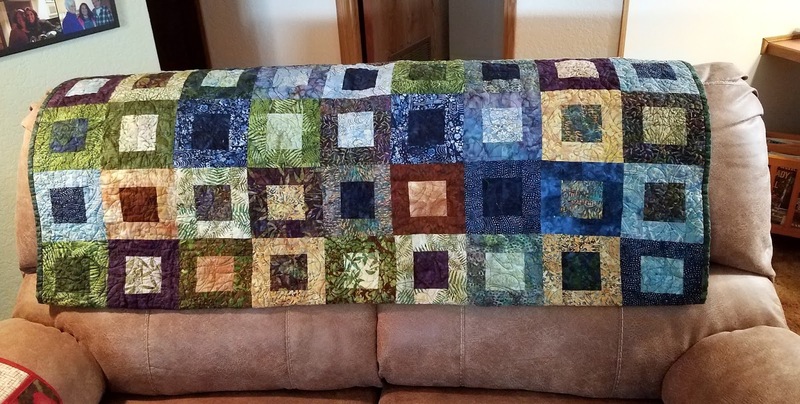 My girlfriend’s new décor needed a green quilt. 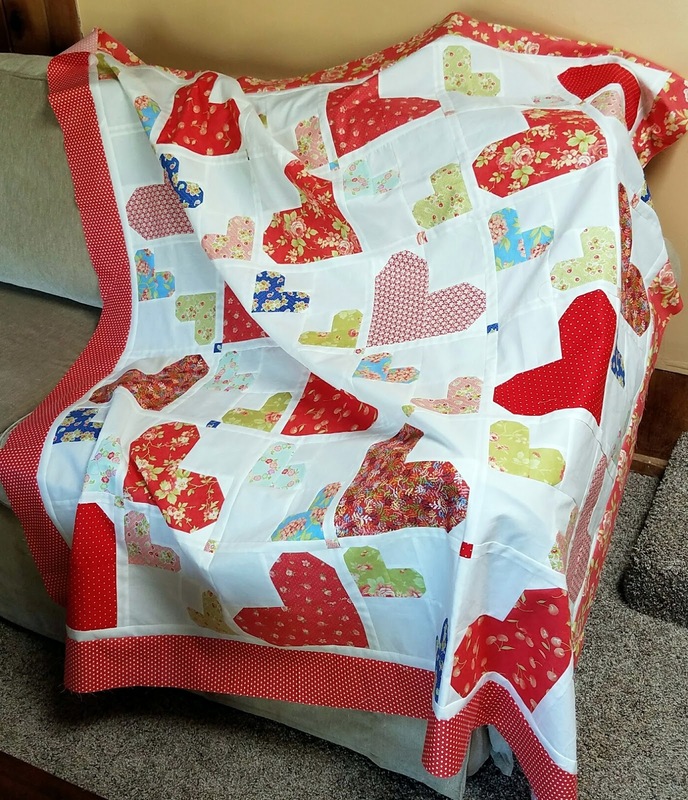 She had an older one I had made, so we traded this out. 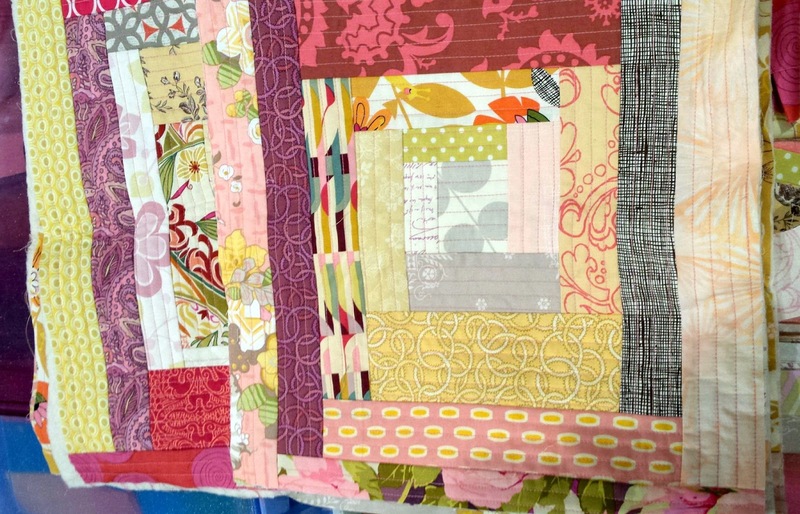 Quilts have a way of getting second lives I believe. I don’t have much to show you this week. 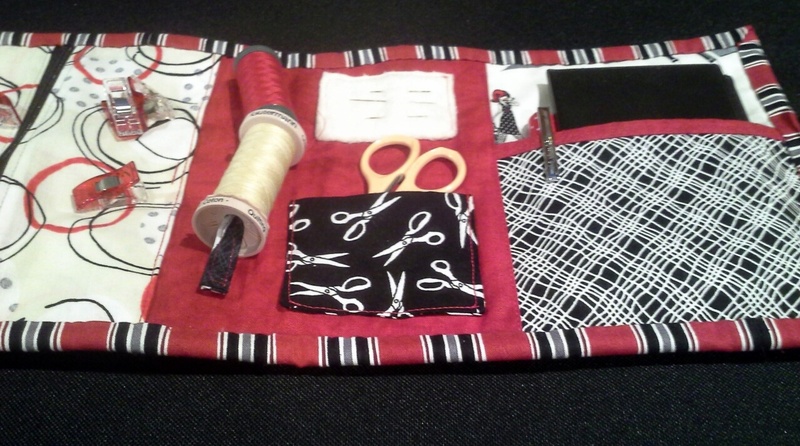 Not a whole lot of sewing going on actually. And, most of what I have completed I can’t post until mid-December. Sigh. 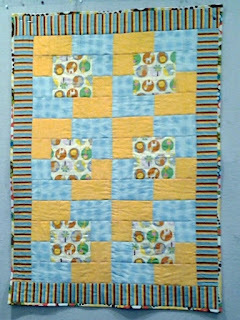 But, I am working on a boy quilt. It still has a long way to go; but, it will get there. I post as I go along. And, in the evenings it’s hand stitching in front of the TV. 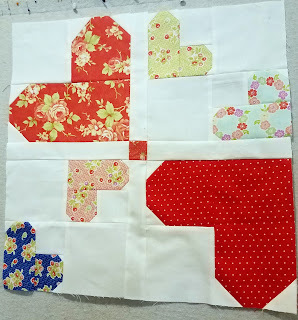 Isn’t this a darling block? 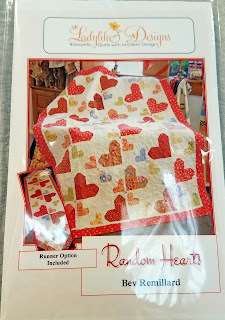 I took Bev Remillard’s Random Hearts Workshop this week. Yes, this is all I have done for the time being. This is Bev’s pattern and you can find out more about the quilt and Bev here. 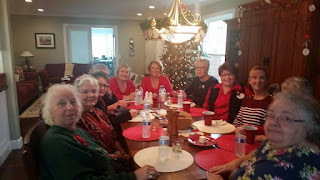 Bev is a great teacher and does a very nice lecture if you are looking for someone to have at your guild. 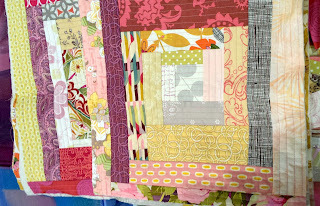 She designs happy, fresh quilts. Sadly I can only show you a hint of this project for the time being. 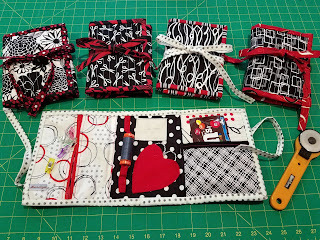 I finished three this week and may be finished with a couple more by tomorrow. I have a bunch of stuff I’m working on. A bunch. In fact, I wrote down 12 different Works in Progress. Looks like I need a new mantra: Finish more; start less. Let’s see how long that lasts. 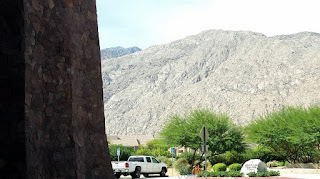 I went to the Mancuso Palm Springs Quilt Fest this week. 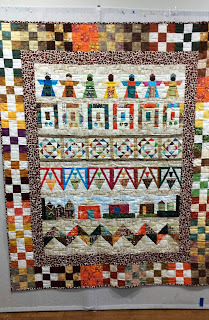 I loved the quilts, especially all the fabulous modern quilts on display. However, I must have been mesmerized because, I got no pictures of them. This is the only one I took. 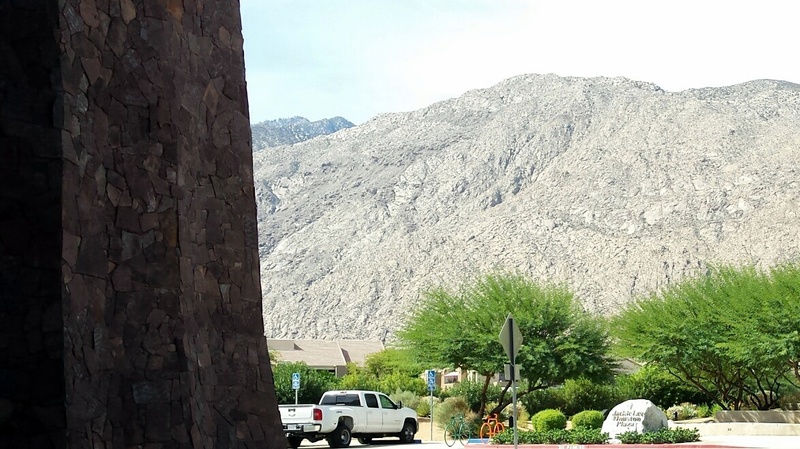 Palm Springs, while a desert, has the most beautiful mountains. A friend and I took a class from Joe Cunningham. 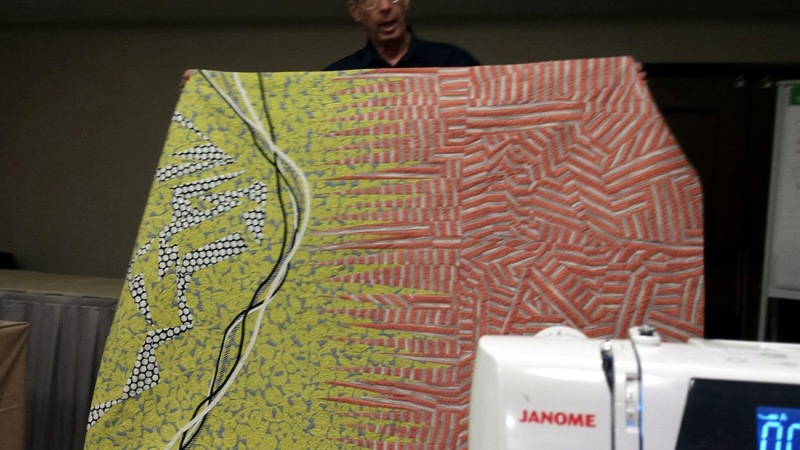 If you are unfamiliar with Joe the Quilter, you can read more about him here. I got most of him in the picture. 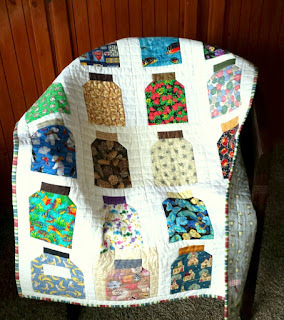 I love this quilt he shared with us. What a great teacher. He taught “Rock the Block” and what fun. Everyone got pretty far with it and everyone loved working on it. 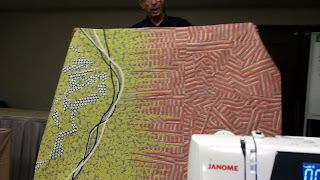 Even my friend, who is a traditional quilter, had a lot of fun using his technique to create a modern look. Here is mine. It is just good to get out of your box now and again. I know I have another UFO; but, I fully intend to work on this before it gets put to the back of the “need-to-work-on” pile. 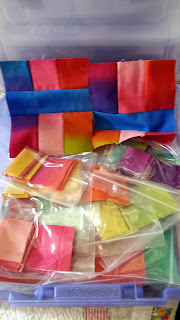 After I got home I decided I needed to knock out a couple of quilts designated for my guild. This one is a “cutter” quilt. 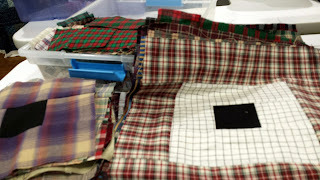 Someone donated a bunch of “cutter” quilts to the guild and my first instinct was to somehow rescue them. OMG, it’s just too big a job. After I started working on this, I realized that I was not going to rescue all these quilts. 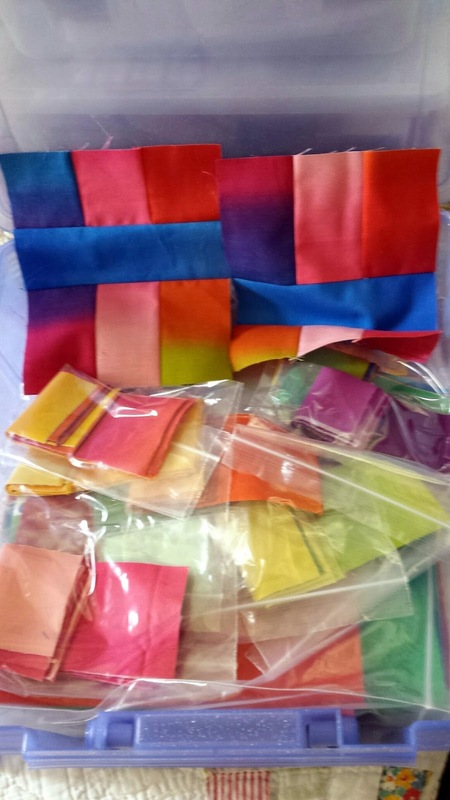 To begin with, it’s even hard to work on fabrics that you never would have in your stash. 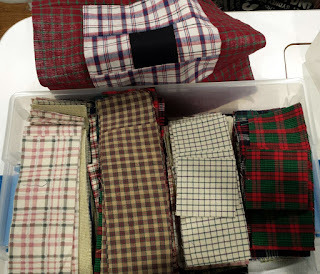 So, the rest were sold at our quilt show in July. I had layered, and pinned it earlier in the year, and even had partially quilted it. So, it didn’t take too long to finish it. 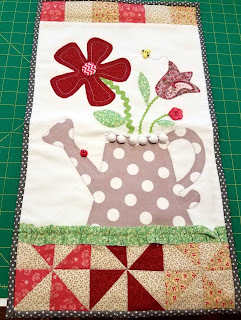 Then I had a quilt top that only needed to be pinned and quilted. 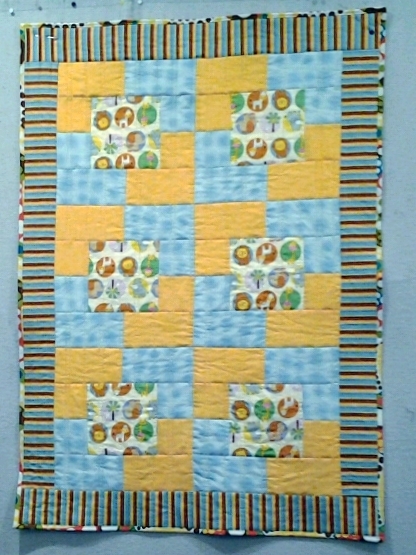 It’s just a tiny baby quilt, but so cheerful. And, it makes me smile. After a week with a full calendar, I finally got in a little sewing yesterday. I made this really cute tote bag with a divider, to carry wine. 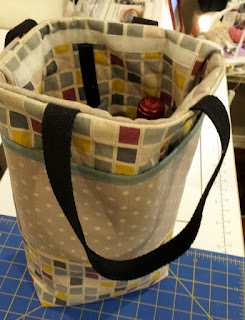 It can hold a couple of bottles or maybe one and a glass or something to snack on. Check out the tutorial over here. 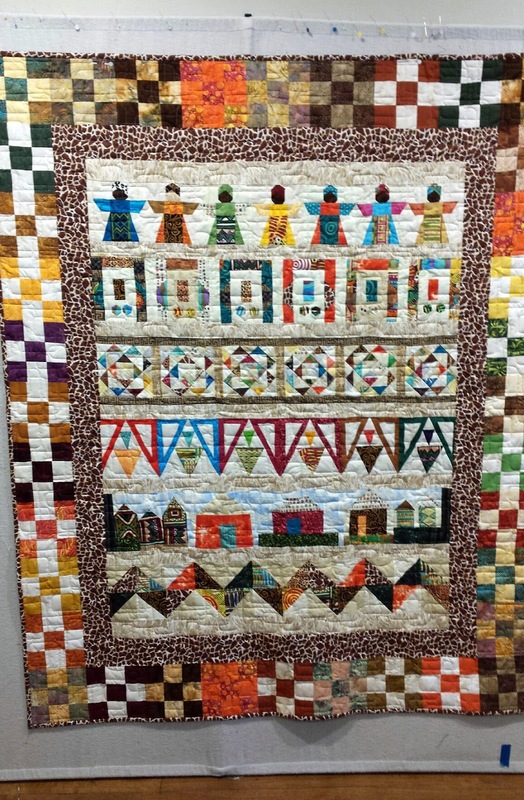 I went to the Rusty Barn Quilt Craft & Sewing Festival in Orange County. I’m always on the lookout for something new. I love gadgets. And, just look what I found. 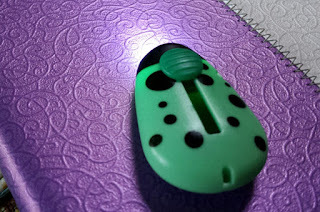 I love the little beetle. It’s both a needle threader and a thread cutter, plus it's lighted. 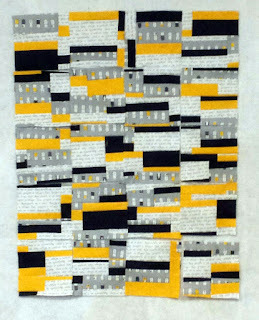 Next week I’m taking a Joe Cunningham class at the Quilt Fest in Palm Springs. What do you think? Another UFO? 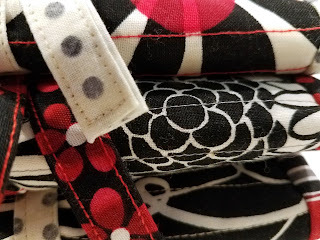 I was at a quilting retreat last week. And, you know what? I now have three more UFOs. Oh yes I do. 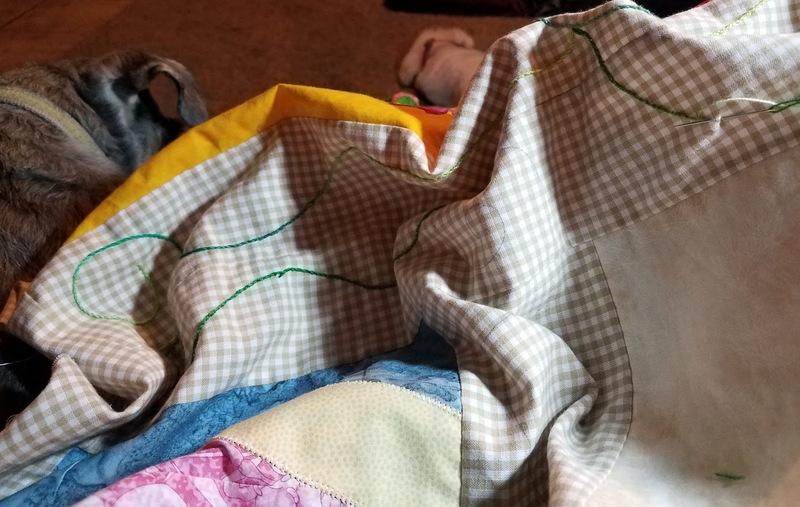 This quilt needs 60 blocks. But, after a full day of making these blocks, I got a bit bored and took on my second project that was all cut and ready to go. 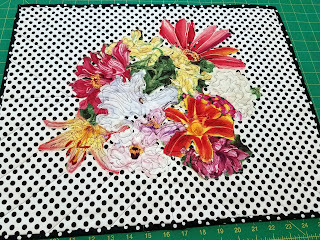 It requires a boat load of blocks and again, I was ready to move on after about ten hours of sewing the same block. This is a quilt as you go project and it is probably a bit more fun watching it come together….and I like the colors a lot. So, I worked on this for two full days. At least I quilted and turned in a little baby quilt for our guild’s philanthropy. 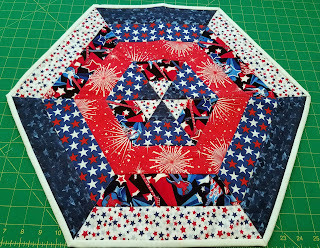 Another member had pieced it. 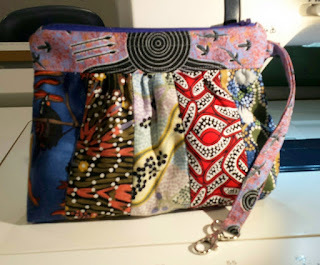 “Out of Africa” is finally finished, right though the binding. 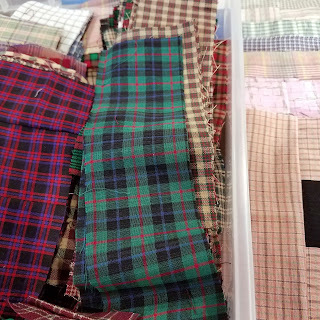 It is a product of a 2014 Row Swap. I think it’s my new favorite. My favorites change often. But, for now…. 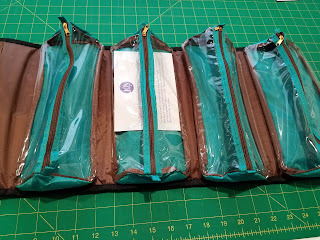 I have put together a few kits to take with me to our Big Bear retreat. The perfect guy quilt kit. 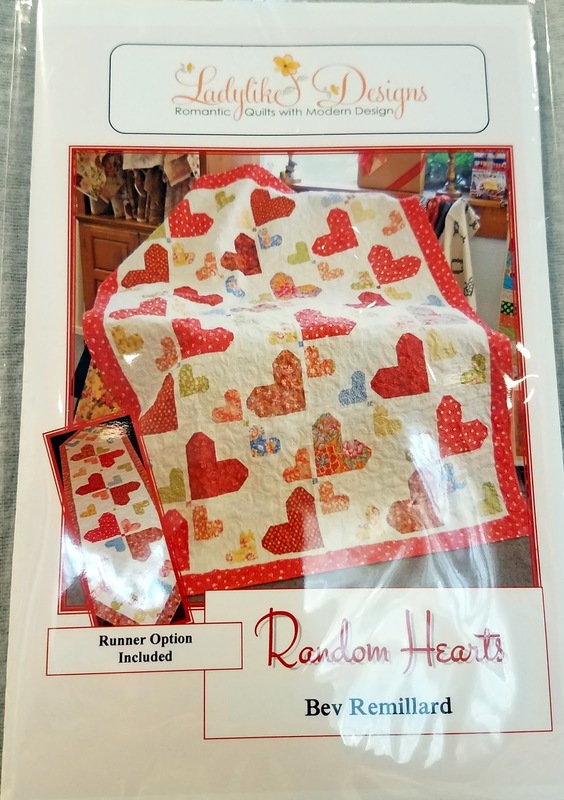 This is another guy quilt kit. But, this is a girly “Quilt As You Go Quilt”. This is the first time I have ever used this technique. 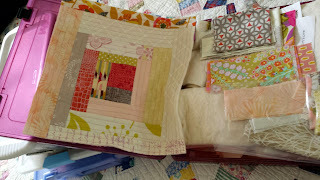 I made this sample block. It’s going to be fun! 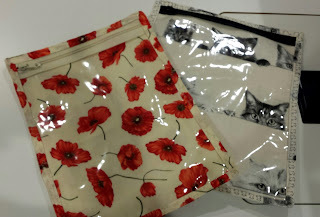 This week I spent my sewing time on small projects. I had a request for a couple of car trash bags. These are fun to make by customizing them for the person’s car. 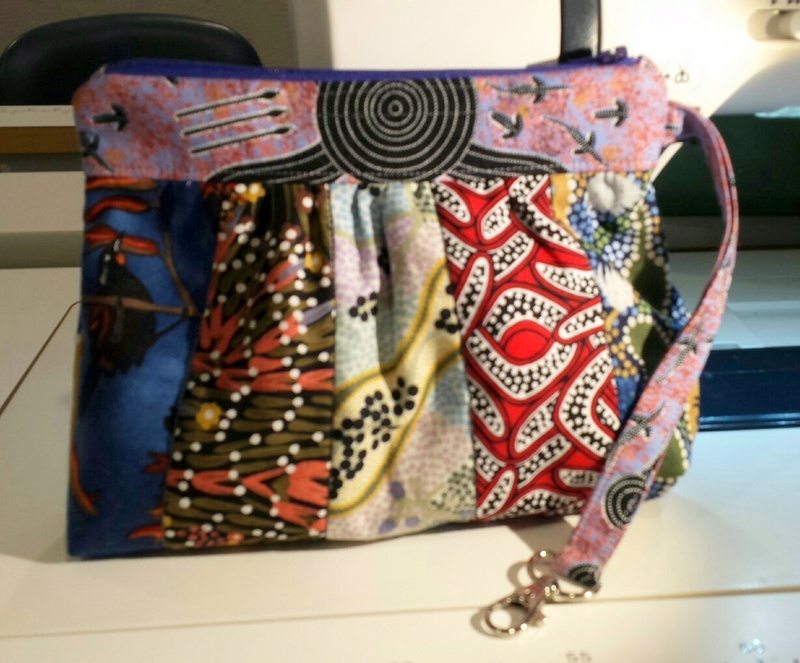 Next I made a rather fun wristlet using Australian fabric. I made it with pockets inside. 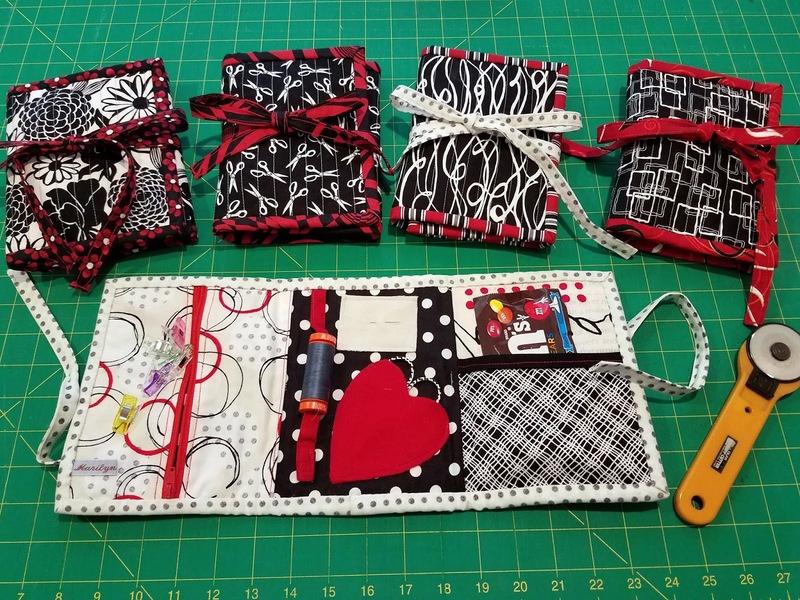 I don’t think pockets add anything to the bag, so I won’t be adding them to any future ones I make. 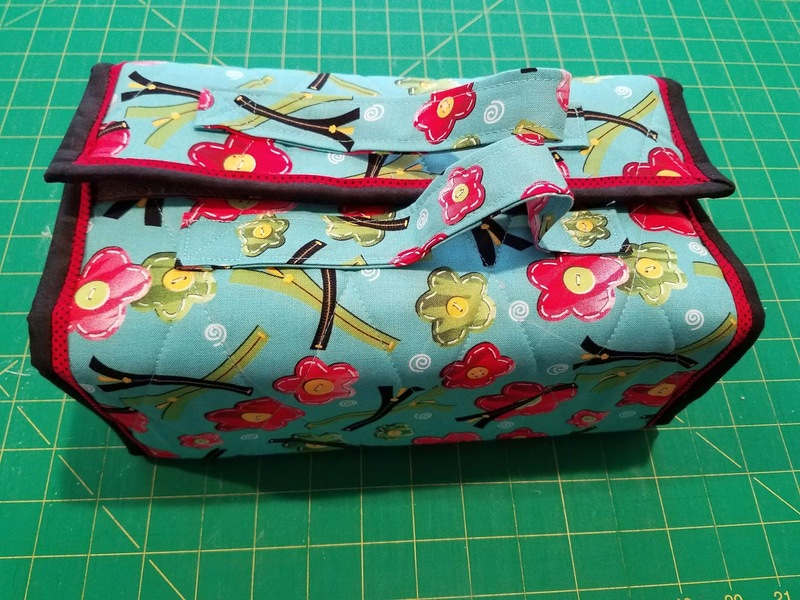 My granddaughter, Noelle, wanted a new pencil case. 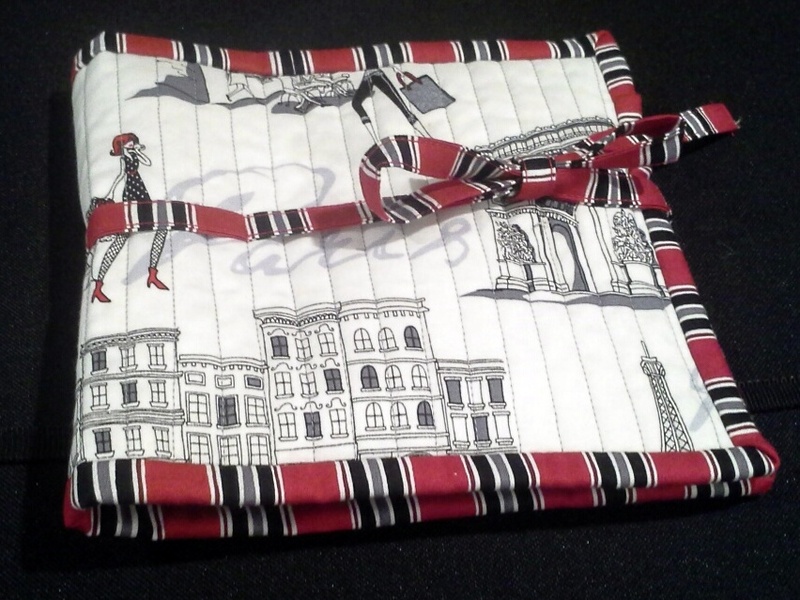 She had one similar to this in size and with the vinyl front. She liked it except for the fabric. So, via camera photos, she selected these two fabrics. I decided to make two in the event she finds more uses. These vinyl cases are so versatile, I decided I needed a project bag. Yes I know a red zipper would have been better; but, I didn’t have one. 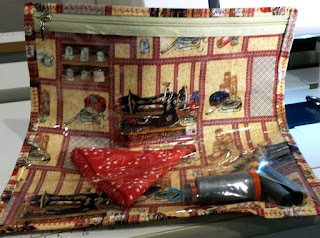 And, this is a pretty cool zipper. So, it will just have to work. 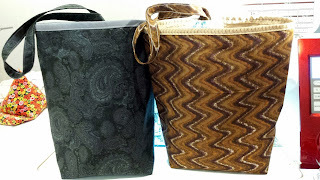 All of these items (except for my project bag) are in the mail and will probably find their new homes sometime today. What a couple of weeks. My computer died. Yes, it just plain died. But, I have a new one and after the pains of getting everything installed, it’s up and running. There are always a few hiccups along the way; but, for the most part, it’s all good. Now, my tablet is acting up. I’m not even sure I will replace it. However, I like using it as a reader. There hasn’t been much sewing. But, there has been a fair amount of company. 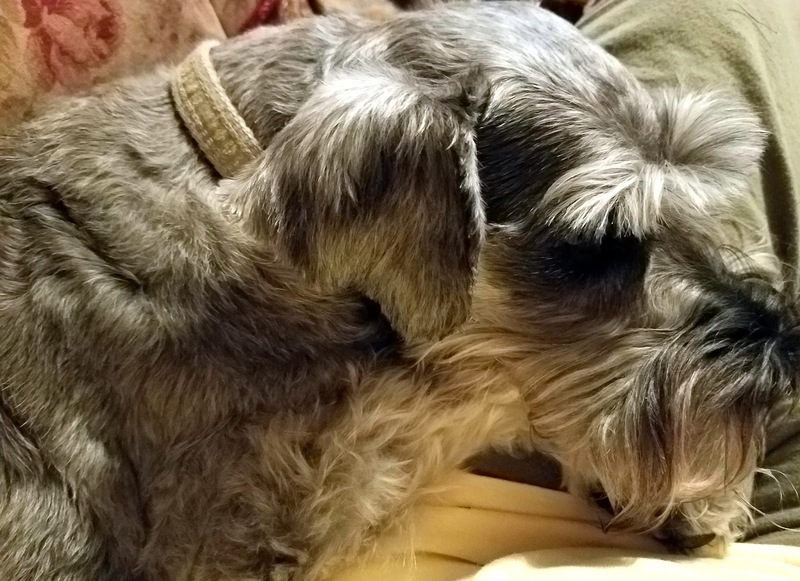 Summer is usually a busy time for me with out-of-town company and this has not proved to be much different. 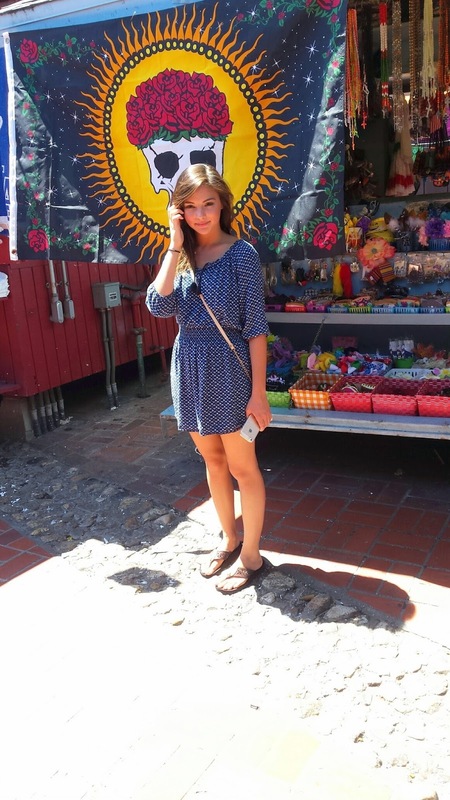 First, a girlfriend stopped off for a few days before she left for the Philippines. I hear she had a great time. 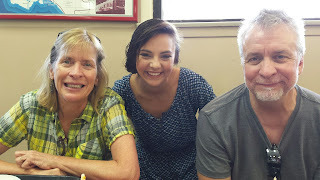 My Granddaughter, Rachel and her beau spent a few days. They had their own car and managed to find their way around on their own. 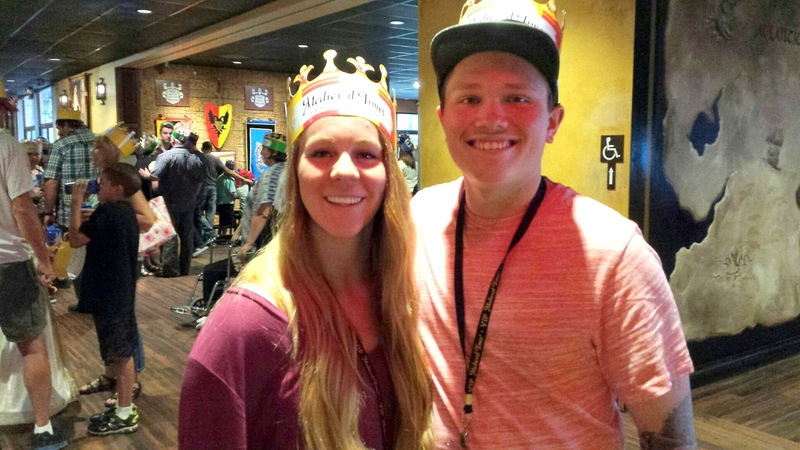 We did take in Medieval Times, which is a family favorite. Then family from Idaho, Utah, and Florida all visited. 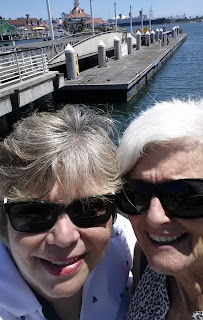 Usually, we mostly hang out around here. 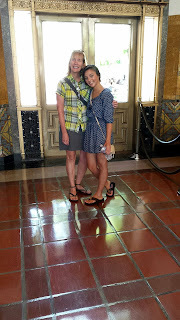 But, this time I decided my 18-year old granddaughter might be interested in some Los Angeles history. Philippe’s, in downtown Los Angeles, was first on the list. Philippe’s opened its doors in 1908 and is credited with inventing the French Dip Sandwich. Next stop was Union Station which opened in 1939. My grandfather worked there as an Engineer for the Southern Pacific Railroad. I remember my family mostly using trains for travel. My granddaughter from Florida stayed on for an additional six days, and, we explored Medieval Times, Catalina Island, Retro Row in Long Beach, and took in a couple of movies. I’m back to normal now. 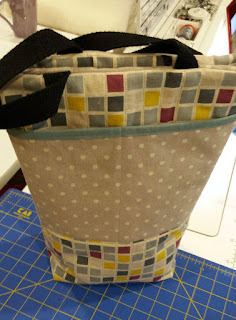 I even managed to sew something I have wanted to try for a while. It’s a Goody Goody Binding Kit. Of course you could probably find other ways to use it. But, for now, I’m going with a Binding Bag.